The Louisville Bats w0n their seventh consecutive game with a 5-2 victory over Indianapolis. Right-handed pitcher Chad Reineke improved to 2-0 after surrendering two runs on six hits in six and two-third innings. Left fielder Dave Sappelt, third baseman Todd Frazier and center fielder Kris Negron all homered for Louisville. The Bowling Green Hot Rods used a three-run fifth inning to earn a 4-1 win over Fort Wayne. Left-handed pitcher Braulio Lara earned the win after surrendering one run on two hits in five innings, and left-handed pitcher Chris Rearick earned the save after surrendering one hit in four shutout innings. The Lexington Legends held 2010 No. 1 pick Bryce Harper to just one hit in a 7-0 shutout win over Hagerstown. Right-handed pitcher Tanner Bushue improved to 2-0 after surrendering five hits in eight shutout inning while striking out four and walking two. Designated hitter Telvin Nash and center fielder Daniel Adamson each homered for Lexington. Louisville native Tyler Kuhn was 4-4 with one stolen base for AA Birmingham. 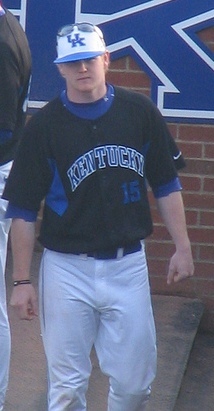 Lexington native and former UK outfielder Collin Cowgill was 3-6 with one RBI, two runs scored and one stolen base. Former UK third baseman Gunner Glad was 3-6 with one double for low A Beloit. Glad’s performance backed a stellar pitching performance from former UK left-handed pitcher Logan Darnell, who took a no decision despite surrendering just two hits in eight shutout innings while striking out six batters and walking none for Beloit. Former EKU left-handed pitcher Christian Friedrich took a loss after surrendering seven runs on eight hits in six innings in a start for AA Tulsa. One-time UofL left-handed pitcher Zach Jackson, who transferred to Texas A&M from UofL, took a no decision after surrendering five runs on nine hits in seven innings while striking out four batters and walking none.